BAX arranges exchange visits that enable British and Arab students or young professionals to meet and to gain an understanding of each other’s countries. In the course of their visit, normally lasting two weeks, participants are given insight into the other country’s history, culture and society, while developing their own skills in leadership and community-building. 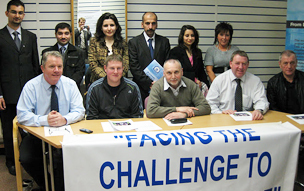 Thirty-seven exchange visits have taken place since 1973, with hundreds of young people participating from Egypt, Sudan, Jordan, the Palestinian Occupied Territories, Lebanon, Iraq, Britain, France, The Netherlands and Switzerland. These visits have opened the participants’ eyes to truths about themselves, their nations, and the experience of others.